The main set comes with four heroes in the Barbarian, Elf, Dwarf and Wizard, each with different core skills, and a host of amazing dungeon creatures, plus orc, goblin and skaven monster groups. The dungeon tiles are excellent including corridors, small rooms and larger objective rooms, and they still stand up well with today’s game standards. The greatest asset of this game is its freeform questing experience, where you never know what encounter will happen next or indeed how many monster you will face. It was a masterpiece of game design, and it has taken over 20 years for newer exploration games to finally match it. This was the first adventure expansion which continued the heroes storyline with pre-written adventures for levels 2 or 3. This has an Orc dungeon setting that is thematic and brilliant, with an Orc boss and a shaman, extra Orc guards and a squig hound. If you managed to get a copy of this then you are very lucky as it is very hard to obtain now, and is probably the most important expansion you can get, given it provides an easy way to continue playing with your heroes after their initial quests. It also expands upon one larger quest from the original roleplay book. The second and final adventure box set was the undead world. Again this is dripping with theme and storyline and this time the pre-written story was for level 5 to 7 adventurers, and is therefore much harder, requiring new extra monsters to help fill the dungeon at the right level. It also remains a highly sought after item and is a beautiful pack, and is generally considered an essential expansion if you are a collector. There were 9 official hero characters released with their own boxes, cards, equipment and rules. These included Pit Fighter, Warrior Priest, Imperial Noble, Elf Ranger, Dwarf Trollslayer, Chaos Warrior, Wardancer, Witch Hunter, Bretonnian Knight. In fact a few more characters were developed and released as print and play rules such as the Halfling Thief and Kislev Shaman. The boxed ones are more than enough to collect in reality, and it is hard to pick out the best ones, as different characters will simply appeal to each player. 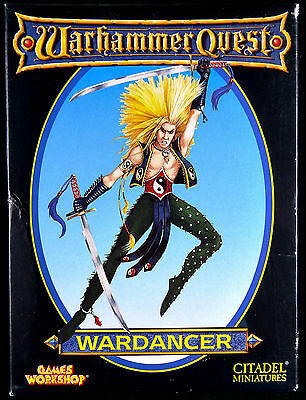 My personal favourites are the Wardancer and Witch Hunter. Many important articles on the game were published in the Games Workshop magazine called White Dwarf. I own all of these and would recommend the following as the best ones to find to expand your game.